The D'Elegance continued the styling of the 1951 K-310 showcar. 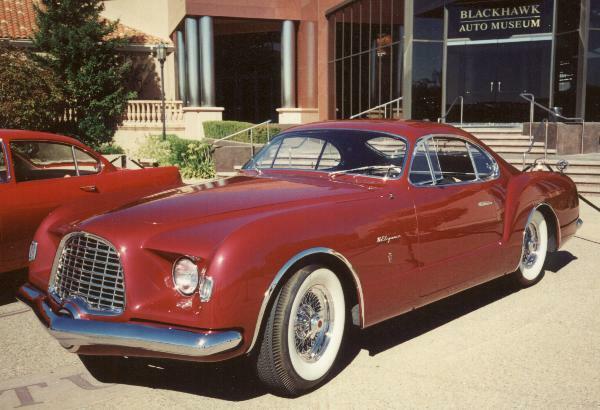 It was built by Ghia, Italy, as most of the Exner concept-cars. there are similarities to the VW Karmann Ghia, and this is definitely not a coincidence! Exner, father and son, suggested later a design for the big Karmann Ghia 1500. To unload the spare-tire, the driver pushed a button on the dashboard. The cover opened, and the spare-tire slipped down, behind the car, so the driver was able to replace the flat tire easily. This concept car was auctioned at Scottsdale, in January 2006, for $1,188,000! In August 2011, the car was auctioned, again, at Monterey, by RM-Auctions, it sold for $ 946,000.